Bonus Post: Food, Glorious Food! Dear readers, I owe you some Daily Bites. Life’s been a little hectic this past week so I haven’t been timely in posting them each day so I apologize in advance. As the school year wears on, this sort of thing tends to happen. 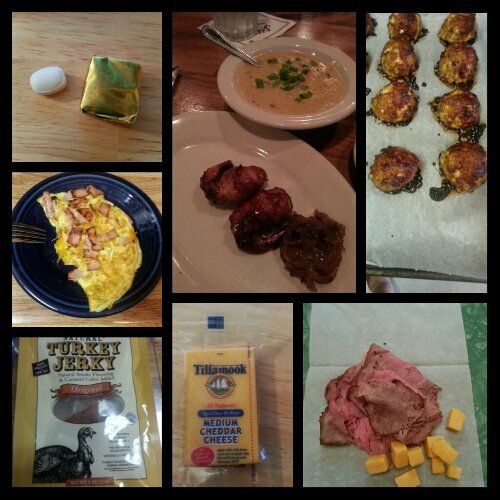 So I bring you the weekend’s eats, plus what I’ll be eating this week that I fixed. Saturday’s food choices from upper left: multivitamin and calcium supplements x2; shrimp and chicken enbrochette with caramelized onion appetizer and a 1/4 cup of baked potato soup from Saltgrass steakhouse; cheesy barbecue turkey meatloaf minis; rare roast beef slices; a Tillamook Tillamoo cheese snack; Trader Joe’s turkey jerky; one-egg omelet with ham and cheese. I don’t know what my problem today was, but I had a lot of nibbles here and there. I still managed to get in all my protein and stay just a hair under 800 calories though. Perhaps I was indecisive in what I wanted to eat because there were so many choices! Today’s food choices, from upper left: multivitamin and calcium supplements x2; Rudy’s pinto beans; leftover shrimp and chicken enbrochette with caramelized onions; Rudy’s smoked ham; Trader Joe’s dark chocolate caramel wedges; honey garlic marinated flank steak; Rudy’s smoked beef tenderloin; half a Trader Joe’s mini beef taco and a tiny bit of guacamole; homemade chicken taco filling. Not shown: Applegate Farms chicken breast slices and Isopure Zero Carb. Upper left: honey barbecue chicken drumsticks. Right: seasoned roasted red potatoes. Bottom left: chicken taco filling. I kept things simple and delicious for this week. 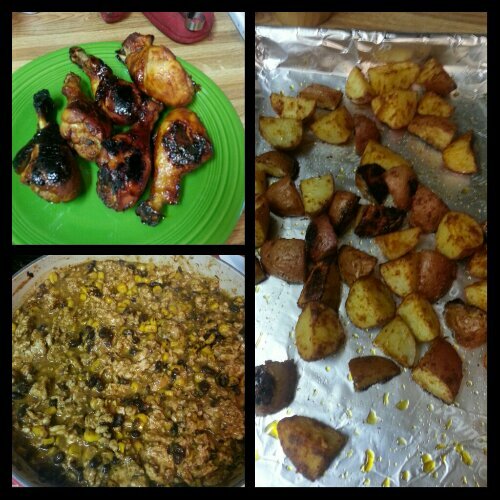 I’d been wanting barbecued chicken, as this is one of my favorite foods in the entire world. So I brined the drumsticks last night in a brine mixture I whipped up on the fly (2 quarts of water, a half cup of barbecue sauce, a half cup of honey and 4 tablespoons of salt) and let them brine overnight. Then I took them out before I cooked them, placed them in a gallon storage bag with a quarter cup of honey, a half cup of barbecue sauce and mixed until the chicken was coated. I lined a baking sheet with parchment paper (the best invention EVER), laid the chicken on it and baked for 50 minutes at 350 degrees. I turned the legs halfway through the cooking time and voila! Delicious. I also roasted some red creamer potatoes. Red potatoes are less starchy and more waxy than russets or other types of potatoes, and thus have a slightly lower glycemic index than their starchier brethren. Red potatoes are my potato of choice for this reason. They also stand up to roasting really well. I took 3/4 of a pound of potatoes, quartered them, coated them in a tablespoon of grapeseed oil and tossed them in a gallon bag with Bridgeport seasoning from The Spice House until the potatoes were coated in the seasoning. I spread them out on a foil-lined baking sheet and baked them for 30 minutes at 350 F. These meals are 3.25 ounces of chicken plus 1 ounce of potatoes. I have leftover potatoes that I will probably eat some mornings for breakfast, and likely for dinner as well. The chicken taco filling is a recipe that I used to make back before we discovered that hubby really couldn’t eat corn or beans (allergies). After that, I stopped making it because it made no sense to fix the dish for just one. Well, now that I am the only one who can eat corn and beans, I decided to make it for myself this week. I took a pound of ground chicken, cooked it in a large skillet, and then added 3 cloves of minced garlic to it, a can of black beans (drained and rinsed), a cup of Trader Joe’s roasted corn and 4 tablespoons of Penzey’s Bold Taco seasoning to the mix along with a cup and a half of water. I let this simmer so the sauce would thicken up and then added a cup of Chihuahua cheese, which is a mellow white Mexican cheese that is very mild. Yummy! 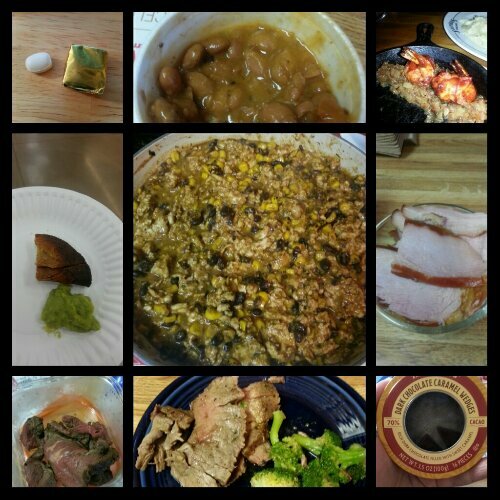 I decided to make this for the fiber content–can’t go wrong with black beans AND corn! I dished this out into half-cup servings for myself for the week. This entry was posted in cooking, daily bites, eating, meal planning, post-op, vsg, weight loss surgery and tagged cooking, daily bites, eating, meal planning, post-op eating, post-op life, VSG, vsg realness, WLS. Bookmark the permalink. Trader Joe’s turkey jerky!!!??? I must look for that next time I’m there, I hope my store has it! Is it good? Oh yeah it is! I like it because it’s portable and has 11 grams protein per ounce. It’s a little carby, with 6 grams, but to me that’s not a big deal since I’m not getting many carbs elsewhere. Give it a try! 6 grams of carbs isn’t much in my opinion. Sounds tasty, I’ll be on the lookout for it. I am glad to hear you say that, because there are some folks who would dismiss the turkey jerky as a poor snack choice based on the carbs alone. I have tried the <40 grams of carbs and it doesn't agree with me. I try to get at least 50 grams daily. As a dietician friend of mine said, "Your brain runs on glucose, so you need to be consuming a little more than 40 grams of carbs a day."